For proven and effective TMJ treatments in Lawrenceville, trust the professionals at Lawrenceville Family Dental Care. We are a comprehensive, family dental practice serving children and adults from Lawrenceville and the surrounding areas. We provide the latest treatments for TMJ as well as complete general dentistry, restorative and cosmetic dental care. Our family dental practice includes an experienced, dedicated dentist. Our dentist is highly trained and has extensive experience treating TMJ. Using the latest advances and treatments for TMJ, our dentist works hard to alleviate the pain and discomfort associated with this common disorder. If you live in Duluth and are looking for a qualified TMJ dentist, turn to the experts from Lawrenceville Family Dental Care. If you are suffering from the pain and discomfort caused by TMJ, we can help. TMJ (temporomandibular joint) Disorders are a group of complex problems of the jaw joint. The symptoms include headaches, ear pain, bite problems, dizziness, clicking sounds, locked jaw or ringing in the ears. By correcting bite abnormalities using dental therapies such as orthodontics, dental restorations and the adjustment of bridges and crowns, our dentist is able to improve the quality of life of many patients who suffer from TMJ. If you have any of the symptoms above or think you may be suffering from TMJ, call our dental practice today to schedule an appointment. 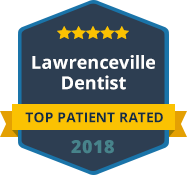 Lawrenceville Family Dental Care provides premier TMJ dental care for patients in Lawrenceville and the surrounding areas. Our practice is currently accepting new patients and we would welcome the opportunity to care for you or a member of your family. If you are looking for an effective treatment for TMJ, contact us today to schedule an appointment. We accept most forms of dental insurance and we also welcome patients who are not covered under a dental insurance plan. We look forward to providing you with high quality dental care.